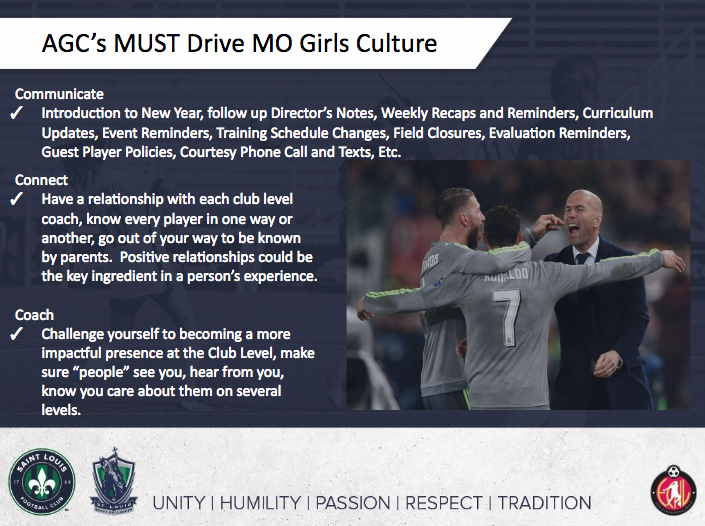 What is an SLSG MO Girls Division "Age Group Director/Coordinator"? Age Group Director/Coordinator (AGC) --> Communicate. Connect. Coach. AGD's can be the difference between a "good" soccer experience and a "great" soccer experience in this club. 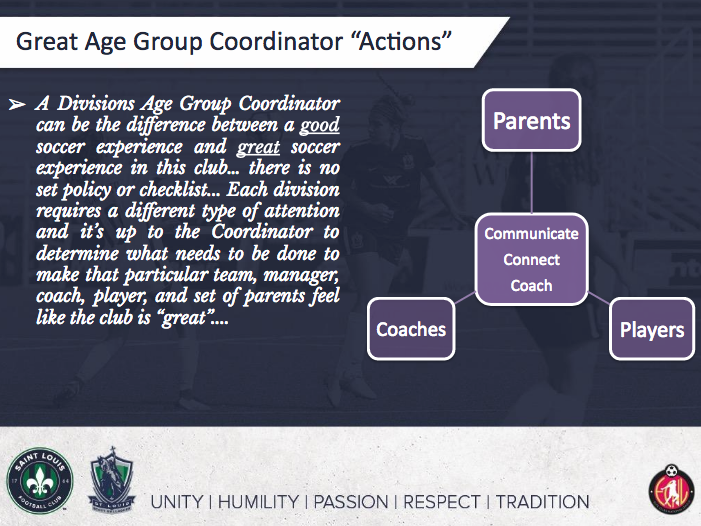 Each Age Group Division requires a different type of attention and it's up to the Divisions Director to determine what needs to be done to make that particular team manager coach, player, and groups of parents feel like the club is a "great" community. In short, a Division Directors is a player, coaches, managers, and/or parents "go to" person in the club. Age Group Director (AGD) will communicate to coaches, managers, and parents through weekly recaps and check in's. AGD will connect with and develop a relationship with each club coach in their Division. And Division Directors will coach the coaches, managers, and parents (or find a person who can) through any situation, question, or concern regarding the game on or off the field. You can expect to hear from these folks in the very near future regarding the Placement Process if you have not already. For more on what to expect from your Age Group Coordinator have a look at the images below!